As Fall advances, coneflowers, milkweed and other favorites of butterflies and beesare producing fewer blooms and concentrating on seed production for next year. There are plenty of plantsthat continue to brighten container andlandscape plantings andserve asnectar sources.There are alsosome native perennials that continue to be very attractive blooming plants right up to the first frost. One group of showy sun loving perennialsis Agastache, a fragrant plant that is sometimes referred to as hummingbird mint, licorice mint, or hyssop. Flower spikes can be blue, pink, red and orange colors. Plants generally grow 24 to 30 inches high and 18 to 24 inches wide and bloom from mid to early fall without needing deadheaded. Agastache foliage varies from small broad leaves to thread leaf types. Anise hyssop, Agastache foeniculum, is rare in the wild in Illinois, but is native to northwestern part of the tallgrass prairie. A. foeniculum produces 3 to 6 inch violet blue flowers from mid to late summer. This summer University of Illinois Extension Master Gardener volunteers added four selections of Hyssop to demonstration gardens in Springfield. 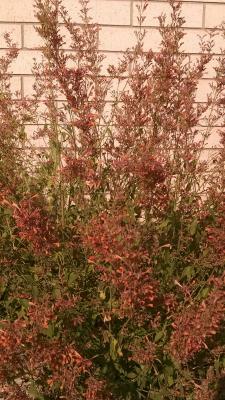 -Agastache rupestris 'Glowing Embers' has orange-red tubular flowers. 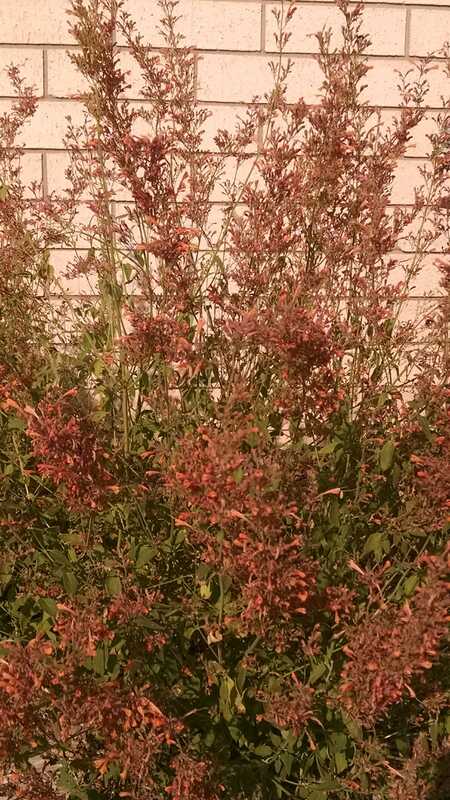 Its fine textured, gray-green foliage has a spicy licorice mint scent. -Agastache Acapulco Orange is a compact 18" by 18" plant that produces orange flowers on tall flower spikes. Acapulco Orange has a strong mint scent. -Agastache 'Blue Fortune' produces powder blue 5" flower spikes on a 36" tall plant. -Agastache 'Desert Solstice' has flower spikes that are a mix of orange and pink calyxes. These stunning flowers cover the entire plant. Desert Solstice grows 36" tall and 18" wide. Several varieties of Agastache planted together produce a beautiful and long-lasting cloud of colorattracting hummingbirds and a great number of pollinating insects including bees and butterflies.Agastache plants are deer and rabbit resistant. These plantsprefer alow fertility well-drained soil.Agastache plants are currently in bloom at our U of I Extension Herb Garden at the Illinois State Fairgrounds; in front of U of I Extension office at 700 S Airport Drive, Springfield; and at the Imagination Station Children Garden at Henson Robinson Zoo, 1100 E Lake Shore Drive, Springfield.